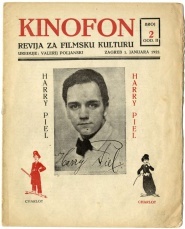 Kinofon: revija za filmsku kulturu was a film magazine edited by Branko Ve Poljanski and Dragan Aleksić in Zagreb, 1921-22. 12 issues appeared. Kinofon is the first journal in Yugoslavia dedicated exclusively to film. Kinofon 2 (1 January 1922). This page was last modified on 7 August 2014, at 14:11. This page has been accessed 4,804 times.